It’s become clear that Twitter and television are in a relationship and that their involvement is only deepening. Today, as TV-related Twitter conversations become more commonplace — spoilers and all — Twitter has become something akin to the world’s digital living room, dominating the second screen. The World Cup was an excellent exhibition of how broadcasters have begun integrating Twitter around live events. Here in Canada, the CBC partnered with Twitter to directly integrate the platform into its World Cup broadcasts with TwitterReverb, a visualization tool for displaying Twitter data. The Ceeb was able to share and embed the data in its programming to showcase the volume of conversation as it was happening around key moments, dialling into what people were saying in real-time, and they were saying a lot. The Twitter stats were quite staggering. The semi final match between Germany and Brazil, for example, set a record for the most tweets ever around a sporting ever at 35.6 million. At its conclusion, the event saw a total of 672 million tweets. “When they showcased [the tweets] on broadcast it really showed the people who aren’t on Twitter the conversation that was happening, and it really encouraged them to participate in the conversation because you could see it live,” explains Ginsberg. It’s with live broadcast — sporting events, news, live event programming like the Oscars and real-time reality programming like The Voice — that the relationship between Twitter and TV is at its strongest. Twitter has been pretty active in working with broadcasters to figure out different ways of integrating the platform into that kind of programming, says Ginsberg. Live real-time voting and polling, in particular, are two big ways broadcasters are using Twitter to around live programming in order to enhance the viewing experience. Scripted TV shows are where the relationship is more tenuous. Often those are shows are not watched en masse (examples like the Breaking Bad finale an exception), with conversation restricted to spoiler alerts, but Twitter and its broadcast partners are working on that, says Ginsberg. “We’re quite heavily invested in making sure broadcasters are educated and up-to-speed around everything they can do to make their shows as social as possible,” Ginsberg adds. That includes encouraging show runners to get cast members live-tweeting episodes and share exclusive content via their show’s Twitter handle, anything that will ultimately generate more conversation around the programming. So, while a shared future is certainly in store for TV and Twitter, with all the work being done to integrate the platform, does that mean Twitter represents THE future of TV? Tessa Sproule, Director of Digital (outgoing) at the CBC isn’t so sure. That’s mostly because of a phenomenon she calls ‘dark social,’ wherein a lot of the social conversation happening digitally is happening in places that can’t be measured or really understood, like private conversations on platforms like Facebook or email. “As a broadcaster, looking at our referrals, we know it’s social, we know it’s either email or someone talking about the program, but we don’t know what they’ve said and we don’t know if it sparked a big conversation or a little conversation,” says Sproule. She also cautions that, that those interacting on Twitter don’t really represent the mass TV audience. It really depends on the type of audience a show attracts and its propensity for using Twitter. “It’s a very specific type of person that seems to be engaging in that way,” says Sproule. “Data collection is a big topic of conversation, both from a broadcaster point of view and an advertiser point of view because there’s a significant amount of data we’re able to capture around people’s TV habits,” says Ginsberg. Twitter, he adds, is currently working on a means of capturing real-time TV data and sharing it with the marketplace. Like all relationships, the one between TV and Twitter will take work and the future is never truly crystal clear. 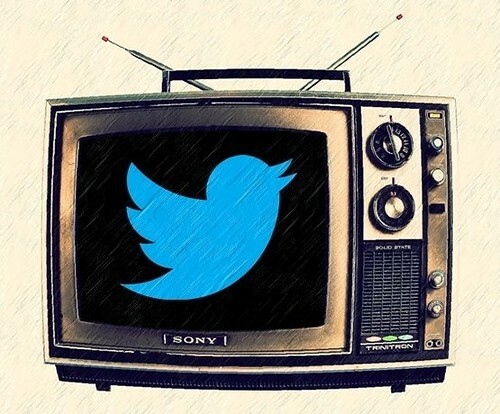 As Twitter and broadcasters continue working together to make the platform a more critical component of the TV-watching experience, it may just be that, one day, Twitter will truly represent THE future of TV. But, for right now, they’re in in the honeymoon phase and the real work is still ahead of them.